Mosquitos love me to the point of leaving huge welts that last a long, long time. Big red marks that fade very, very slowly. They look ugly for a long time too. It’s been a problem for me my whole life whenever I lived in a buggy place. When I was a little girl living in Indiana, our day camp had a sleep over for the and the next morning they had to call my mom to have her pick me up. Not only was I covered with bites, I also had a fever. The mosquitos had made me sick! And yes, like every other kid in the camp, I was doused with OFF before retiring to my sleeping bag. Didn’t work. Unfortunate, because I loved camping. For whatever reason the mosquitos have always loved me. Maybe my blood is just tastier? Sweeter? Redder? Or maybe my skin is thinner and easier to bite? Now that I live in the West Nile Virus capital of Texas (not really but you’d never know it from listening to the news about the West Nile epidemic we’re experiencing), I’ve taken matters into my own hands. The city threatens to aerial spray unless everyone does their part. So I do mine. Remember, the Mortroski Midcentury Urban Farm is all organic so I can’t Napalm the backyard with any old chemicals. And the 3G Network spends a fair amount of time back there too. But I need it to work so I can enjoy digging in the dirt and sitting on the patio on a warm breezeless evening. Using a hand-held fertilizer spreader, I covered the entire backyard with CedarCide this morning before work as George chased Godiva around the yard, stopping only to shred a toy. It was the perfect day to do it since it was a bit breezy and that helps with the spreading (and keeps the little bastards from biting me since they can’t fly if there’s wind). 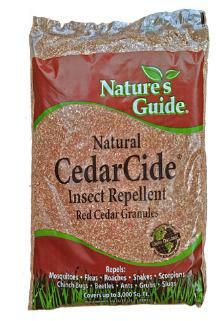 Last year I had terrific luck with CedarCide after learning about it at North Haven Gardens. It lasts quite a while, smells pretty nice, and it doesn’t bother the Gs (or their humans) one bit. After this application, I’ll probably need to apply again in a month or so depending upon how much rain and wind we get. 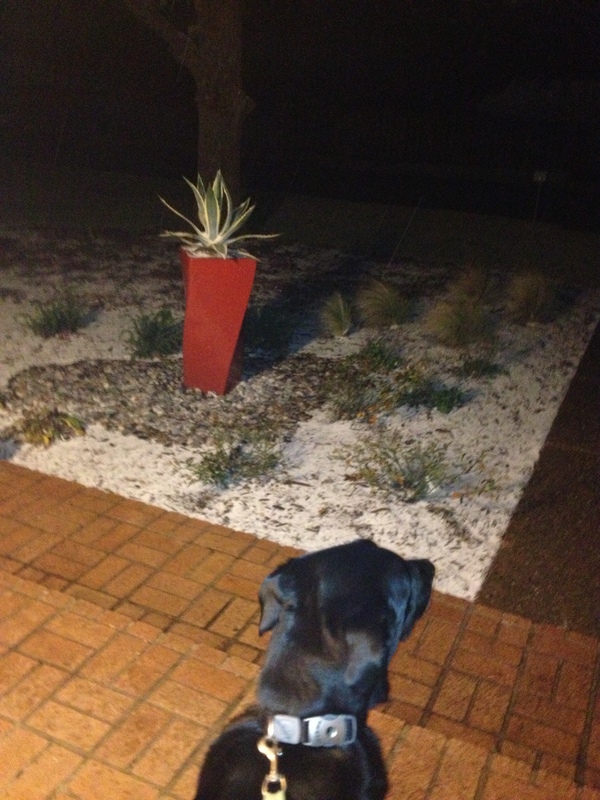 Standing water is a no-no if you are trying to prevent the mozzies so the birdbaths get dumped and refilled daily. All four rain barrels also get dosed with Mosquito Dunks once a month. Don’t they look like little donuts? Yes, they are chemicals, but apparently the more natural ways of treating the water do not work nearly as well. As for the Gs, they get monthly heartworm prevention medicine. Guinness was heartworm positive when we found him and had to go through treatment twice to get rid of the disgusting, murderous heartworms. It was bad enough that it was super expensive, but it was horrible for him to fight through. No walks for months. Poor Godiva didn’t enjoy having her big pal so sick for so long. 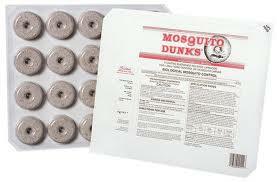 Just thinking about mosquitos makes me feel itchy and I’m inside! They are definitely one part of outdoor life in North Texas that I could do without. Do you have mosquitos or other nasty bugs where you live? What do you do about them?